Leaflets are still a great way to promote your business. We design and print a lot of them, so we know a thing or two about what works and what doesn’t. 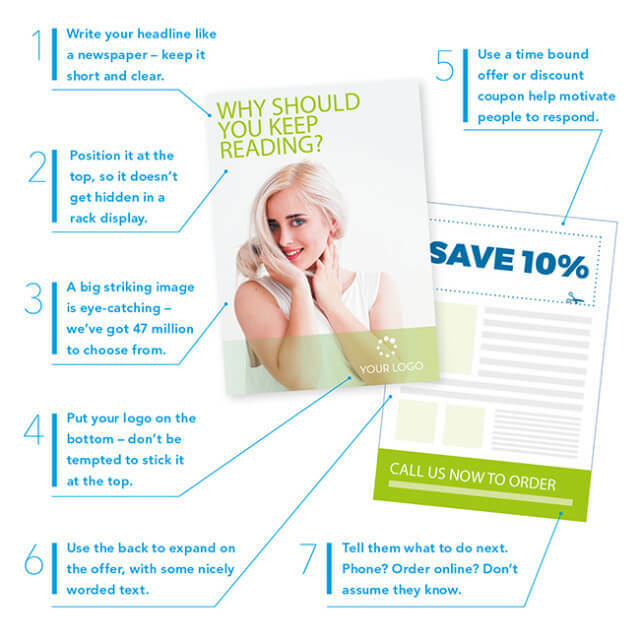 So here is our Seven Secrets to Leaflet Success. Why not use them and help get 2016 started as you mean to go on. Write your headline like a newspaper – keep it short and clear. Position your headline at the top of the page, so it does not get hidden in a rack display. A big striking image is eye catching – we have lots of stock images you can choose from. Put your logo at the bottom of the page – do not be tempted to put it at the top. Use a time bound offer or discount coupon to help motivate people to respond. Use the back of the leaflet to expand on the offer, with some nicely worded text. Tell the recipient what to do next – phone? order online? – do not assume they know what to do. So the secrets are out!!! We would love to talk to you about your next leaflet project so why not give us a call on 01543 261220 or send us an email.